Flavor Text: Did we learn nothing from Summerhall? question: the character that i have to kneel,have to be mine? or may i kneel somebody else character? The character must be yours. You can never pay a cost of a card with another players resources, be it gold, discarding, kneeling, etc. Any card that has the formula of "Do X to do Y" implies that X is a cost of the effect and you cannot pay costs with cards you don't control. So you have to kneel one of your own holy characters for this effect. Actually, "to" is the key here. 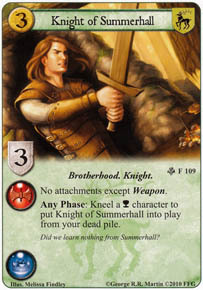 Do you need a Knight of Summerhall already in play to activate this ability? Or will this activate from the dead pile? His ability specifically lets you use it while he is in the dead pile. So if I have two of these in my dead pile, do both of them turn up after I kneel a holy character? No. You need to kneel two Holy chars.